Whether you are building a new home or office or upgrading to a new, more efficient cooling and heating system for your present location, Trane’s line of leading comfort equipment has a capacity, efficiency and price that will suit your needs. Complete system installations include cooling, heating, air cleaners, comfort controls and accessories. Rutledge Air Services’ installation experts will gather detailed information so that the right equipment can be selected for maximum comfort at minimum energy consumption. When repair is not cost effective because of age and poor efficiency, our comfort consultants will analyze your home or office comfort needs and suggest equipment replacement options that are best for you. Sometimes the reason your indoor environment is not cooling properly is because of inadequate unit size. If your air conditioner is not large enough to produce the proper cooling capacity, it will be almost impossible to keep your space comfortable. We’ll design a system engineered to specific load calculations to give you maximum comfort and energy savings over the long haul. Indoor air pollution can actually be worse for you and your family than outdoor pollution. If you want cleaner, healthier indoor air, let the experts at Rutledge Air Services inspect your home’s ventilation and air intake sources. 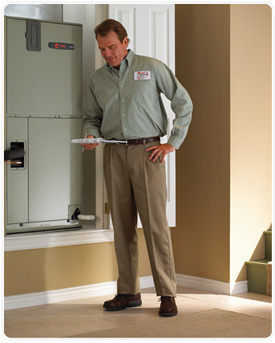 We will evaluate your home's air intake systems and modify them as necessary to achieve optimal air flow. We'll also check possible air pollutants within your home, like stoves and heating systems, and make adjustments so that they're operating at a safe air capacity. When necessary, we can also add air filtration systems to your home to filter possible contagions. Our Commercial Department provides a full range of services to customers. From maintenance and repairs to new installations of heating, cooling and refrigeration equipment, let our trained service technicians provide the solutions you need to keep your building in business and your business on budget. In the design stage of your next facility, we can also help you create an efficient and cost-effective system that meets the specific demands of your business over a long product life cycle. Have a question or need service? Please don’t hesitate to be in touch. Call (770) 788-7688.